One of the best starter green houses is sold by Harbor Frieght Tools. There are two sizes, I recommend the larger size as the temperature will fluctuate less than the smaller one. The price of the larger Greenhouse is $599 and it includes four vents and foundation/frame. Click here for more information. P.S. Harbor Freight Tools shipping charges are very reasonable. 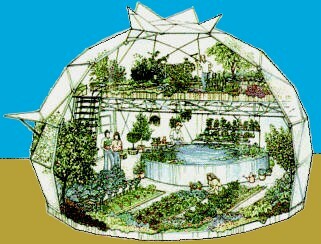 Here is a link to www.NWGardenDomes.com - Garden Domes are strong and allow you to grow food year round even places with very cold winters. Now is a good time to invest in your family's independence, just look at the news headlines lately. Here is a link to information about Solar Heated Greenhouses. You can use barrels of water, a wall of rocks or concrete, or many other ways to store heat during the day that slowly releases at night. On the middle of this page there is an example of a solar pit greenhouse. These people, The Growers Solution have many supplies for Greenhouses and their prices are pretty good. I have found it valuable to check prices at least two other places before spending money, that is, until I am familiar with the value of a product. Also, remember to search the internet for discount codes, you will be amazed at how many stores offer online coupons. This website has a list of free greenhouse building plans and information Sherry's Green House.